I'm a specialist in inheritance and succession planning. Here at Nicola Sunderland TEP we advise families on how best to preserve their assets for future generations and to save inheritance tax. We draft wills, trusts and Lasting Powers of Attorney. It is the designation given to full members of STEP – the worldwide professional association for those advising families on estate planning. WOULD YOU LIKE INFORMATION ON WILLS AND LASTING POWERS OF ATTORNEY? These easy-to-understand guides will help you. Choosing a professional to help you deal with such important and often sensitive issues can be difficult. Many aspects of planning are non-regulated, meaning anyone can write a will, for example, regardless of training or expertise. With a TEP, you’re in safe hands. For more information, please click the ‘Download Guides’ button below. There may be serious implications for your family if you don’t make one. Your home and property may not be distributed according to your wishes, and you risk depriving family members of their inheritance, even their home. Your family may face additional distress at a difficult time. Click here for more information. So why make Lasting Powers of Attorney? They allow you to make provision in advance for the possibility of you becoming incapable of managing your own affairs during your lifetime. This becomes increasingly important as the risk of mental incapacity grows through living longer, illness or accident. Click here for more information. 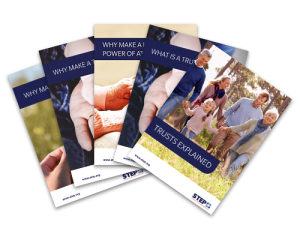 How can using a trust benefit my family? Trusts have been used by families for centuries to provide a means to protect their assets and control their use after they have been given away. They help ensure that children do not inherit ‘too much too soon’, provide tax planning opportunities, and may prevent disinheritances. Click here for more information. Arrange a free initial meeting. Chat through your circumstances to make sure we are the right people to help you. Take action today and put your Will and Lasting Powers of Attorney in place. The TAS Network is a small group of high quality independent estate planning professionals who trade as individual companies. It provides a supportive environment for members to regularly share ideas, technical information and best practices. All members attend structured training sessions to grow their technical knowledge and expertise. All members undertake to comply with the Client Charter.